It’s a delightful quick fix for the seasoned mountaineer short of time. It’s ideal for beginners wanting to experience an inexpensive truly big mountain. Its exotic, close to home and combines everything adventure should be; amazing scenery, colourful bustling cities, crazy friendly locals and a mountain that throws everything at you. What is it? Jebel Toubkal. Summer and winter expeditions available. It doesn’t always have to be about the biggest, the highest or the best. How about the most magical, exotic or interesting? There are some mountains whose mystique outweighs their physique, whose mere location on the on the map creates an unparalleled trekking experience and whose people add a dimension which touches on magical. 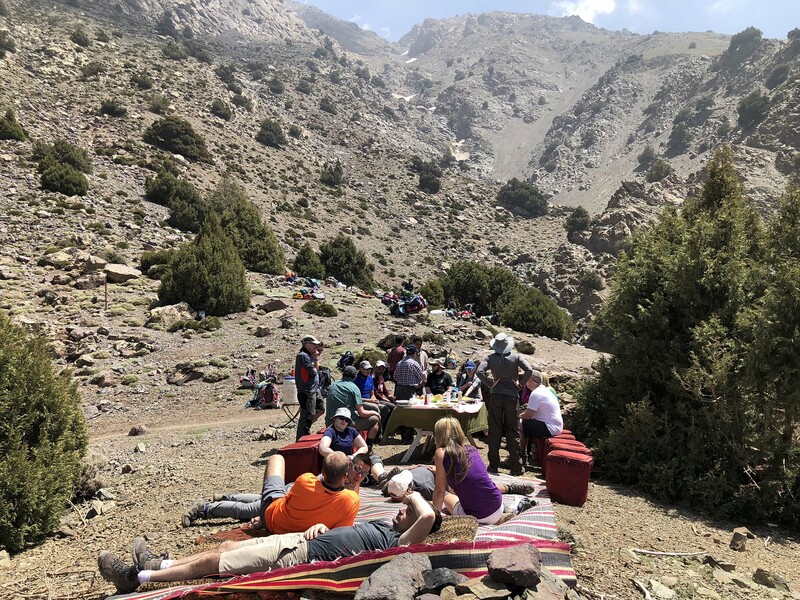 “I felt like Alice tumbling into wonderland” is how one of my trekkers once summed up her experience of climbing Jebel Toubkal, the highest mountain in the North African Atlas. After arriving into the heat and exotic bustle of Marrakesh, meeting the snake charmers and artists of the Souk, seeing the incredible architecture of the Great Mosque, discovering ancient untouched traditions and staying in a magnificent traditionally decorated Riad, you will be whisked up and transported to the colourful High Atlas market village of Imlil. Here heavily laden donkey’s mix with rickety lorries and curious women and children wearing colourful head-scarves. Robed, heavily moustached stall owners entice with both fruit and trekking paraphernalia. Walnut trees line the cobbled streets and the enormous ochre coloured Kasbah, framed by the enormity of the Atlas can easily be spotted high on its airy mountain perch. Completely different to normal life are words which cannot even begin to sum up your first day. The magic of this expedition is created by the suddenness of being thrown into something totally different and once the trekking starts you will be transported into a time left far behind by the routine and measured way of the life which we all take for granted. You will have a sense that the unexpected could happen anytime. A feeling of that same magic like Alice in wonderland. Who would have thought you would meet a world wizened old man of unfathomable age whose only form of transport is a donkey of similar vintage or a cheerful colourfully dressed little girl walking along the stony path on the way to school, or that you would climb a mountain from which top you would be able to see the vast expanse of the Sahara Desert. Tiny snippets of a life less ordinary will captivate and swirl around you at every moment. 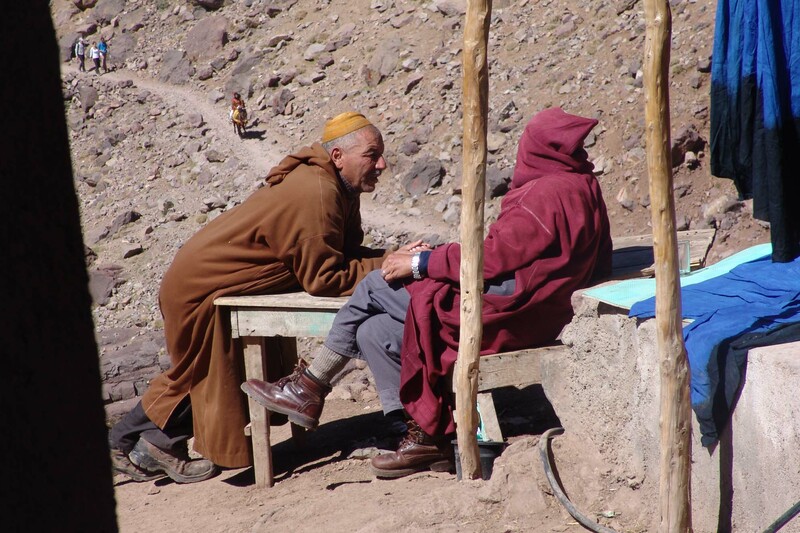 The people of the Atlas – the Berber – create a bulk of the intrigue and wonder. Living remote lives and keeping up traditions unaltered by the passing of centuries, they are always welcoming and always proud to reveal a glimpse of their mountain lives. Being less known the Atlas are not hindered by myth. They are not worshipped as gods or surrounded by tales meant to scare or frighten. They are just there, wild and vast. And as such, you climb on them with an open mind and let the stories come to you. From your own experience you create your own myths and take them home with you. Stories of arriving to a welcoming Moroccan meal at the high refuge, stories of first climbing the mysteriously named Quanoukrim, whose 4000-meter-high summit proves to be an unexpected but welcome surprise to reach. Stories of the unfamiliar mountain animals you saw, other trekkers you met. Stories of how these wild and remote mountains looked with a fresh cover of snow. Stories of how you needed an ice-axe and crampons to climb a mountain in Africa. 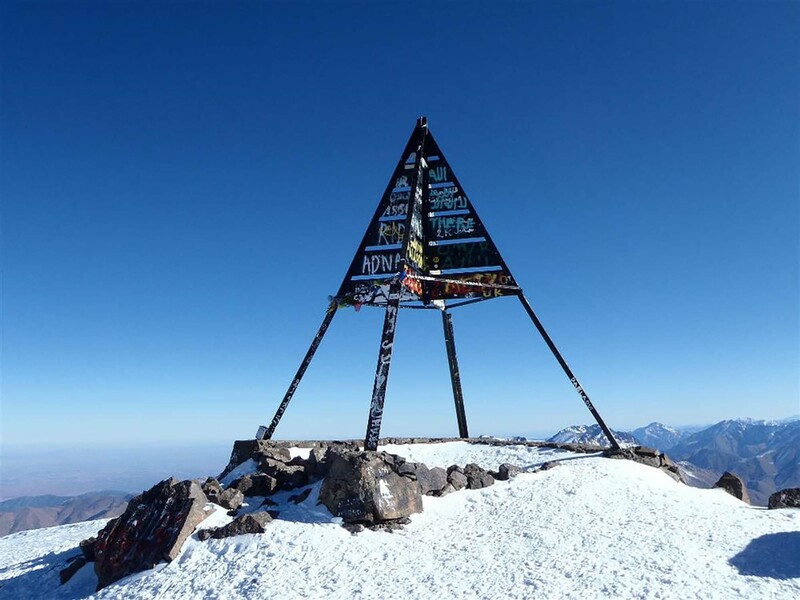 Stories of the magnificent views you had when you finally reached the summit of Toubkal, North Africa’s highest. Stories of how you gasped in the rarefied air and stared in wonder at all those summits stretching out into the vastness of the Sahara. Alice in wonderland indeed. But the magic will have been reality. And it will be you who will come back changed and utterly refreshed and wondering how all this could have been possible in such a short space of time. I love this peak and can’t wait to go back. Rolfe. Here is another blog from last months trek to this stunning peak. Have a good read then come and knock on our door so to secure your place. 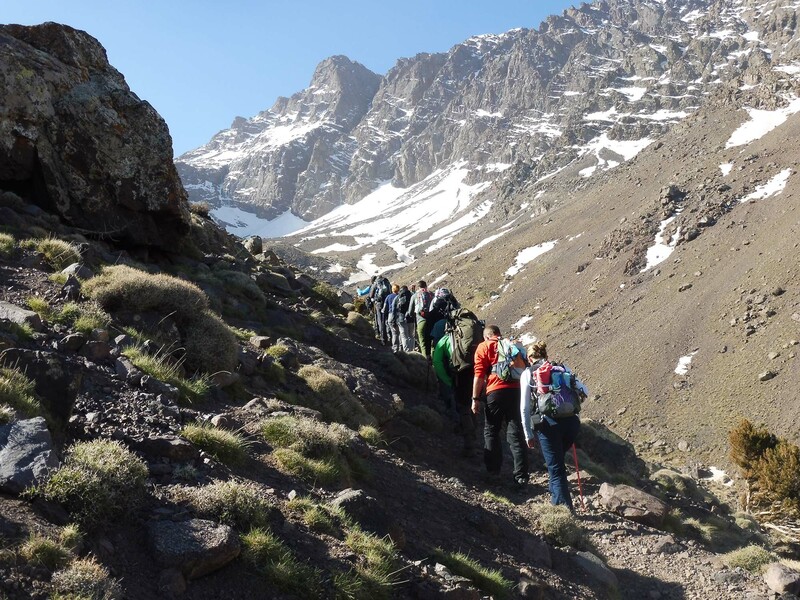 To book Toubkal summer ascent click here. 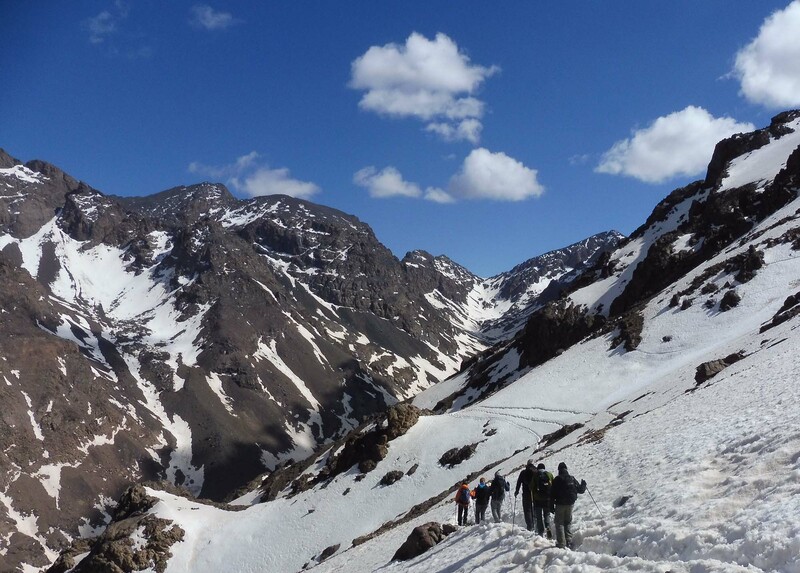 To book Toubkal winter ascent click here.